Have you ever wondered how the progress of your investment fund is measured? All investment funds are compared to a relative index that reflects its mandate. These indices act as benchmarks or "targets" that are used to judge performance with the intent being to select funds that out-perform their relative benchmark. The most common example for a Canadian benchmark would be the S&P/TSX Composite Index (with dividends reinvested), which has posted an average return of 9.9% a year. By comparison, the benchmark for Aggressive Investors with 100% exposure to US Small Cap Equities indicates an average return of 10.3% and Very Aggressive Investors, invested solely in Emerging Markets can expect returns of 13.2%. At the other end of the scale, those investing only in the Short-Term Fixed Income category can expect average returns closer to 4%. At Fernhill, when choosing investment funds, we compare the Rate of Return (ROR) of the fund, to the ROR of the benchmark that reflects its mandate. To compare your portfolio with its benchmark, and to determine if your investments are on track ,you can use either the time-weighted method or the money-weighted method to calculate returns. Time-Weighted returns are inadequate for judging performance because they fail to take into account the results an investor's actions have had on the final outcome, such as the timing of contributions or withdrawals. The Money-Weighted return recognizes all external flows of money into and out of the portfolio and weighs periodic returns according to the assets under management during the period. In other words, a money-weighted return takes into account all factors relevant to the specific investor, including the timing of an investor's decision to add or withdraw funds and the affect those decisions have made to the portfolio. Given that this technique produces a much more accurate rate of return, it is the recommended method used in the industry. Single indexes are suitable for comparing the ROR for individual investment funds that share the same mandate; however, how can you accurately measure the performance of a portfolio of funds against the benchmarks of multiple indexes? Depending on an investor's objectives and risk tolerance, at Fernhill we use six overall investment portfolios. Based upon the composition of each portfolio, the historical return of the related indexes is weighted and calculated, producing a benchmark for that portfolio in the form of a targeted return. For example, the targeted return (benchmark) for Fernhill's portfolio's ranges from approximately 5% to 9.5%. These benchmarks are then used to measure and evaluate the performance of each portfolio. It is important that this comparison not be done by reference to a single year's return. After all, the target return constitutes a long-term benchmark over a period of many years and even good portfolio managers will underperform the benchmark from time to time. Most investment funds include an MER (Management Expense Ratio). The MER is a pre-determined percentage that is used to cover the expenses of operating the investment fund including the portfolio manager's fees and sometimes the firm/advisor's commission. The MER is paid out of the portfolio's assets, regardless of whether the investment made a profit. When calculating an investment funds rate of return, the MER should not be included as this would be equivalent to counting it twice. However, if the investor pays any fees directly, such as by cheque, this should be included in the calculation for the rate of return. Fees paid directly by the investor or self-directed trustee fees paid within the plan should be treated as external cash flows and included in the calculation. We calculate the money-weighted return by finding the internal rate of return (IRR) associated with the portfolio's cash flows. The formula for this calculation is in Figure 1. 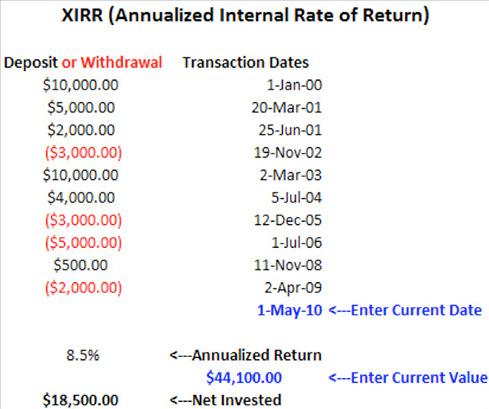 You can also calculate the internal rate of return by using the XIRR function in Microsoft Excel. 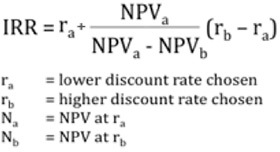 The money-weighted calculation results are illustrated in the screenshot shown in Figure 2. If you are curious about whether you're on target, speak with your Fernhill advisor about your rate of return and subsequent benchmark. Remember, it is important that a comparison not be determined solely on a single year's result. The longer the time frame used for comparison, the more accurate the comparison.